Rollin' n' rockin'. 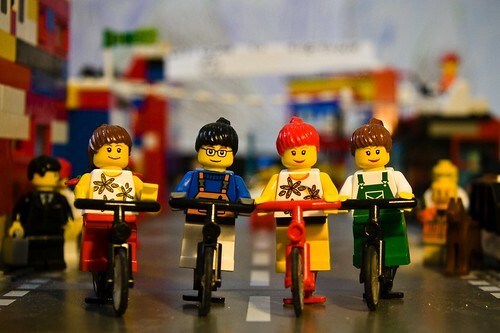 The Cycle Chic Bike Gang. You don't want to mess with these badassé girls... but you secretly hope that they'll mess with you. They make you drink tequila late at night and ride until you drop. That's just how they roll. We've been thinking about those Mexican girls again haven't we! they look tougher then my bike gang! And besides, they're all obviously quite square. The smile is simply our cover. Watch out. This is pure gold. And what serendipity! My husband is spending this evening getting his City Lego presentation ready for pecha kucha in our city.